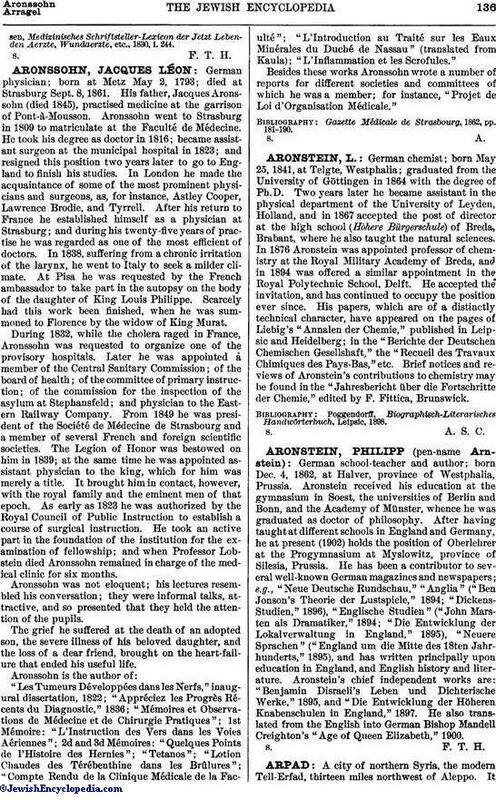 German physician; born at Metz May 2, 1793; died at Strasburg Sept. 8, 1861. His father, Jacques Aronssohn (died 1845), practised medicine at the garrison of Pont-à-Mousson. Aronssohn went to Strasburg in 1809 to matriculate at the Faculté de Médecine. He took his degree as doctor in 1816; became assistant surgeon at the municipal hospital in 1823; and resigned this position two years later to go to England to finish his studies. In London he made the acquaintance of some of the most prominent physicians and surgeons, as, for instance, Astley Cooper, Lawrence Brodie, and Tyrrell. After his return to France he established himself as a physician at Strasburg; and during his twenty-five years of practise he was regarded as one of the most efficient of doctors. In 1838, suffering from a chronic irritation of the larynx, he went to Italy to seek a milder climate. At Pisa he was requested by the French ambassador to take part in the autopsy on the body of the daughter of King Louis Philippe. Scarcely had this work been finished, when he was summoned to Florence by the widow of King Murat. During 1832, while the cholera raged in France, Aronssohn was requested to organize one of the provisory hospitals. Later he was appointed a member of the Central Sanitary Commission; of the board of health; of the committee of primary instruction; of the commission for the inspection of the asylum at Stephansfeld; and physician to the Eastern Railway Company. From 1849 he was president of the Société de Médecine de Strasbourg and a member of several French and foreign scientific societies. The Legion of Honor was bestowed on him in 1839; at the same time he was appointed assistant physician to the king, which for him was merely a title. It brought him in contact, however, with the royal family and the eminent men of that epoch. As early as 1823 he was authorized by the Royal Council of Public Instruction to establish a course of surgical instruction. He took an active part in the foundation of the institution for the examination of fellowship; and when Professor Lobstein died Aronssohn remained in charge of the medical clinic for six months. Aronssohn was not eloquent; his lectures resembled his conversation; they were informal talks, attractive, and so presented that they held the attention of the pupils. The grief he suffered at the death of an adopted son, the severe illness of his beloved daughter, and the loss of a dear friend, brought on the heart-failure that ended his useful life. "Les Tumeurs Développées dans les Nerfs," inaugural dissertation, 1822; "Appréciez les Progrès Récents du Diagnostic," 1836; "Mémoires et Observations de Médecine et de Chirurgie Pratiques"; 1st Mémoire: "L'Instruction des Vers dans les Voies Aériennes"; 2d and 3d Mémoires: "Quelques Points de l'Histoire des Hernies"; "Tetanos"; "Lotion Chaudes des Térébenthine dans les Brûlures"; "Compte Rendu de la Clinique Médicale de la Faculté"; "L'Introduction au Traité sur les Eaux Minérales du Duché de Nassau" (translated from Kaula); "L'Inflammation et les Scrofules." Besides these works Aronssohn wrote a number of reports for different societies and committees of which he was a member; for instance, "Projet de Loi d'Organisation Médicale." Gazette Médicale de Strasbourg, 1862, pp. 181-190.